Transport Malta and the Environmental Resources Authority have warned mariners, scuba divers and bathers to stay clear of the site of the former Azure Window in Gozo. They said everyone should stay well away of the area for safety reasons and until surveys and inspections are carried out. Transport Malta said the structure's collapse has caused a change in seabed and coastal topography of this area and is therefore unsurveyed. Mariners should therefore not navigate in the area. 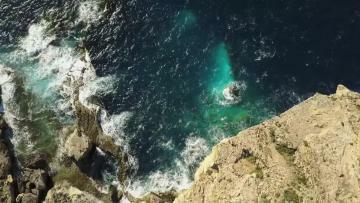 The warning comes after the first underwater and drone footage of what was known as the Azure Window have emerged online. A YouTube clip uploaded by diver George Vassallo on Sunday shows huge chunks of what was once Gozo's most admired rock, now underwater at Dwejra in Gozo. The Azure Window crashed into the sea last Wednesday, after centuries of fascinating millions of tourists and locals. Contacted by Times of Malta, Mr Vassallo, a professional diver who was born and bred in San Lawrenz, said the clip was shot this morning. He said it appears that the pillar collapsed first because of deterioration to its inner side. Upon closer inspection, it appears to have tilted outwards, causing the roof to crash into the sea, amid raging winds, he said. Mr Vassallo, who has been diving the Dwejra site since he was a child, said the rubble of the Azure Window starts from 10 metres underwater and ploughs down to some 50 metres. 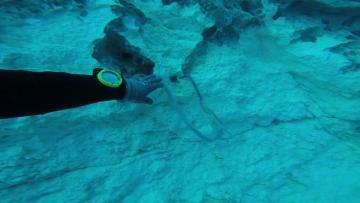 A number of divers were seen in the area this morning despite a temporary ban in place. Later in the day, a video by Raniero Borg was posted online showing the crumbled Azure Window in more detail. This morning, the first drone footage showing an aerial view of what appears to be the remains of the Azure window were also posted online. The Azure Window was created after two limestone sea caves collapsed. The authorities insisted nothing could be done to prevent its collapse.